This spacious 4/5 bedroom detached property is located in a quiet residential cul-de-sac in the popular village of Mesogi . ​The International School of Paphos is within easy walking distance, together with a good range of local amenities including shops, restaurants, gym, supermarket and coffee shops. 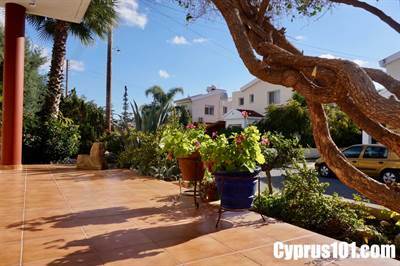 Paphos town centre and the coast are just a few minutes’ drive away. The property is an ideal family home and includes many extras such as double glazing, central heating and log burner fire. The ground floor accommodation features a large, open plan living room including lounge and formal dining area, separate fully fitted kitchen with direct access to the garden and space for family dining, guest toilet and single size bedroom also ideal for use as an office. A staircase from the living room leads up to the master suite, three further double bedrooms and family size bathroom. The master is particularly spacious and benefits from en-suite facilities, dual aspect windows and direct access to a covered balcony with horizon sea views. There is plenty of outdoor leisure space with two good size outdoor terraces, one to the front and one to the rear. The private and mature landscaped gardens include a variety of shrubs and plants and there is scope to add a swimming pool if required. To the side of the property is a driveway with parking space for two cars and an external store room. Title deeds are available making this highly suitable for those seeking permanent residency through the fast track scheme who wish to have a fully completed home without having to purchase off plan.